The latest Shrek film, after the nosedive that the 3rd one took for the series - begins in 3D, and with Shrek dissatisfied with a life featuring a wife and 3 kids and not much else. He longs for the old times where villagers would flee at his name, and he was a fearsome ogre rather than a cute cuddly one. Truth be told, so do we. This being a fairy tale pastiche, there's a way to do that for Shrek. Enter Rumpelstiltskin with a magic contract. Thus begins an adventure where Shrek must reclaim his old life back from ol' Rumpel, featuring a lot of satire and general collage of fairy tales and pop-culture. While the result is generally clever and fun, the very lynchpin on which the Shrek films have hung - the satire and pastiche potpourri - feels a bit old and stale. When the first film came out 9 years ago, it felt fresh and original. After almost a decade of franchise development and merchandising, the ostensibly final chapter in the saga feels fun, but it all seems like we've seen it before. It's cleverly done, given that they changed at least one writer and the director, but you realize at every gag that this has been done before, and better, albeit not in 3D. Being a slightly more disorderly version of "It's a Wonderful Life", the setting feels a little stale, yes, but it is the chaotic running around and incessant old gags that get tiring. The direction is solid throughout, Mike Mitchell dishing out action and comedy in perfectly balanced morsels - until the end, where we see a montage of all the previous Shrek films, reminding us of how much better at least two of them were. This time around, too, there is a similar arc to the proceedings. In exchange for one day as a proper ogre, Shrek promises Rumpelstiltskin one day from his childhood. Little does he know that Rumpelstiltskin was almost on the verge of taking the spell off Princess Fiona from the first film when Shrek came in and saved the princess, foiling his plans. Rumpelstiltskin, back in this movie, decides to take the day of Shrek's birth, which means the world is an alternate version of the one we have been seeing. This gives room for some gags, and a lot of adventure, as Fiona is now a fearless Ogre leader, Donkey is a slave to evil witches, and Puss is a tubby cat that cannot fit in his boots. As Shrek goes about saving his life in the one day he has left before he stops existing altogether, the ride takes us through numerous action sequences and a hefty amount of gags. There aren't any surprises, as we know Shrek will get the "true love's kiss" on which the film hinges, and that there will be a quest which will have hijinks. It's innocuous fun, but while it may be enjoyable from time to time, it is a constant reminder of the fact that we have seen this before, and better. Dreamworks have been doing some great stuff lately, especially with 'Meatballs' and 'Dragon' but this time around, the only fun the studio adds is well-done 3D. This being billed 'The Final Chapter' the writers bring back every single character from the previous Shrek films (except the dead ones), but get so busy cramming the film with so many old characters and references they forget to add anything new. If you have children who love the series, do take them - it's not the worst Shrek film. 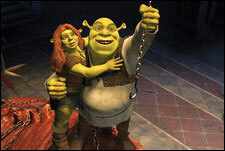 Be the first to comment on Shrek Forever After - 3D! Just use the simple form below. fullhyd.com has 700,000+ monthly visits. Tell Hyderabad what you feel about Shrek Forever After - 3D!